Wondering what to do with that quart of eggnog... besides drink it, of course? Use it to make these delicious eggnog-scented, cinnamon chip-studded scones. In a separate mixing bowl, whisk together the egg, vanilla or other eggnog flavor, and eggnog. Transfer the dough to a lightly floured work surface; a silicone rolling mat works well here. Divide the dough in half; each half will weigh about 18 ounces. Roll and pat each half into a 6 1/2" circle about 3/4" thick. Using a knife or bench knife that you've run under cold water, slice each circle into 6 wedges. Alternately, use a 2 1/4" round cutter to cut each circle into 6 to 8 rounds, gathering, re-rolling, and cutting the scraps. Or cut one circle into wedges, the other into rounds. If you've made wedges, transfer the circle of wedges to a lightly greased or parchment-lined baking sheet. Carefully pull the wedges away from the center to separate them just a bit; there should be about 1/2" space between them, at their outer edges. If you've made rounds, transfer the rounds to the prepared baking sheet, placing them close together; leave about 1/2" between them. 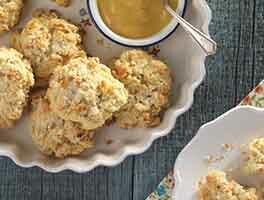 Brush each scone with some eggnog, and sprinkle with sparkling white sugar, or cinnamon-sugar. Bake the scones for about 20 minutes, or until they're golden brown. When you pull one away from the others, it should look baked all the say through; the edge shouldn't look wet or unbaked. Scones are best served warm. They're delicious as is, but add butter and/or jam, if you like. 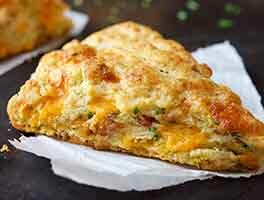 To reheat room-temperature scones, place on a baking sheet, tent lightly with foil, and warm in a preheated 350°F oven for about 10 minutes. Why such a range in the amount of chip; 1 to 2 cups? Using the full 2 cups will produce a very sweet, American-style scone; using fewer chips will produce a less-sweet, more classic scone. Cinnamon chips are one of my favorite seasonal ingredients, and I'm always looking for new recipes to use them in when the holiday baking season arrives. These scones were delicious and didn't last long. I just ordered some of the eggnog flavor to use in place of the vanilla extract when I make them again. These are absolutely delicious. I just took the precaution of measuring the chips a tiny bit scant. Probably made very little difference. I have a problem in that my scones tend to burn in my silicone scone pan. And this was way way worse than ever--even tho I monitored the temp and the pan was well above the center of the oven. I cut away fully a third off the bottoms. Even with all that burning, they were still quite moist and delicious. I've thought of trying to put the scone pan in a quarter-inch of water or on a rack in somewhat deeper water. Any advice? I really do love this silicone and love these scones. ;-( Can I find complete happiness? ;-) Thanks. The recipe is a very good base for scones. I tweaked the recipe to cut sweetness a bit (and also because I had leftover eggnog on hand but no cinnamon chips). I substituted 2 tsp of Vietnamese cinnamon and dried fruit juice/sweetened cranberries for the chips. No sugar on top. I froze the scones and baked them a few weeks later, without thawing first, in a 400 degree oven for 30 minutes. Delicious! Just made these this a.m. for my family who thought the scones were delicious! They baked just fine in my Toaster oven on the bake and convection setting. 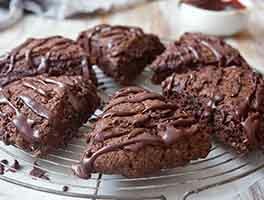 I make several batches at Christmas time and have done so since I found this recipe years ago. The eggnog part is fine. Cinnamon chips are simply disgusting. You're mashing a spice into a chip with god knows what other ingredients. If I wanted unnatural, fake-flavored chips, I'd use the awful Nestle butterscotch chips. 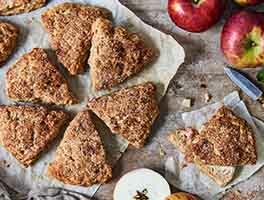 'Cinnamon-eggnog scone is a misnomer,' because the cinnamon flavor comes from something as tacky as peanut butter chips, when the real ingredient is not hard to find. I baked these scones for New Years breakfast and they were astounding. 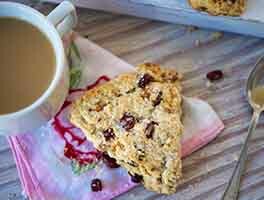 I've made scones before, mostly successfully, but these were really wonderful, a little crisp on the outside and soft but not chewy on the inside. I cut the butter in with my hands, stirred in the liquid a little then finished up by hand. I've been watching Paul Hollywood too much I guess. I used only half a bag of cinnamon chips I had left over and that was plenty sweet for us. I saw some reviewers warning about them burning. I made the dough the afternoon before and put it in the freezer over night. I baked them in the middle of my main oven at 400 for about 30 minutes with a second cookie sheet under the first one and they were perfect, no sign of over baking on the bottoms. The house stilll smells lovely. Great recipe folks!